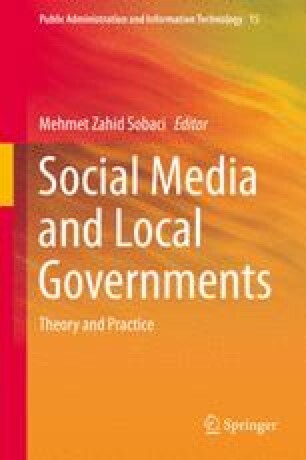 The objective of this chapter is to provide an initial assessment of Facebook use by Western European municipalities considering two aspects: citizens’ engagement and municipalities’ activity. The sample for this study comprises the 15 earliest member countries of the EU represented by the five largest cities of each. Thus, data on 75 local governments are employed to test the following research questions: (1) How are Western European municipalities using Facebook? and (2) How are citizens engaging with their local government by using Facebook? In order to answer these questions, a set of metrics will be used that can help governments interpret and understand their impact in the use of social media. The answers to these questions will help to determine whether the use of social media is indeed increasing citizen participation in local governance. Results show that the use of Facebook by some of the biggest Western European local governments has become commonplace. Thus, the availability of a Facebook page is confirmed as a symbol of modernity and responsiveness, which may be perceived as particularly necessary for political legitimacy, especially in times of crisis. The audiences of the official Facebook pages of Western European municipalities are rather high. But a high number of fans does not automatically mean an engaged audience and citizen engagement, in general, is still low. Therefore, these findings suggest that the interest is limited on the part of citizens in terms of engaging in conversations with local governments. This study has been carried out with the financial support of the Spanish National R&D Plan through research projects ECO2010-17463 and ECO2011-28267 (ECON-FEDER).